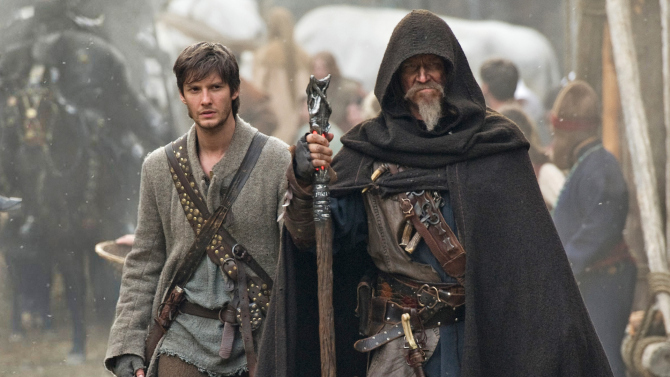 For an installment of myth, the usual seventh son of the seventh son sort of stuff, you have to see Seventh Son. It has dragons, ghosts, spirits, shapeshifters, the lot. It has the obligatory love story thrown in, but with a little twist. It is also very entertaining. So imagine my surprise when Tom, the apprentice spook (like a knight that fights the supernatural), is inducted into the order with the words of the great Rudolf Otto in The Idea of the Holy – “mysterium tremendum et fascinans“. So, as well as relating to the experience of the numinous (or divine, God), it is also a terrifying and fascinating mystery to experience the supernatural (I guess it is). Also, main spook Master Gregory talks in a really weird and annoying way, and I’m not sure if it was part of the acting or not. Strange. I was a little bemused by the use of “mam” – since when did these strange olde-worlde American types use the term? I thought it was only geordies (and others) around North East England that used it. It did sound rather odd in the American accent – more like they were trying to say “ma’am”. I guess it’s the absence of the short vowels we’re so fond of. Linguistics aside, it was an interesting twist that Tom, the apprentice spook fighting the bad witch, turns out to be half-witch himself, and has fallen in love (told you there was a love story) with another half-witch who has been forced to spy on him by her mother. Her mother is sisters with the Queen of witches, Mother Malkin, but in the end betrays her to protect her daughter. In typical good-conquers-evil fashion, the young lovers fight the final battle alongside the expert spook Gregory and win. Maybe it’s just me, but I can’t get away with 3D films, and this one was no different. The whole screen is never in focus, the glasses are irritating and too big but I can still see the rims, and I am conscious of the 3D effect for the whole film. I think it’s partly a consequence of not usually wearing glasses, but I also think it’s something to do with the way my brain processes images. But 3D effects aside, it is another film I would recommend as a bit of light entertainment. Probably not for the film buffs though!